Jessica’s First Book, The Behavior Code: A Practical Guide to Understanding and Teaching the Most Challenging Students, with Nancy Rappaport, was published by Harvard Education Press, April 19, 2012. Learn a systematic approach for deciphering causes and patterns of difficult behaviors and how to match them with proven strategies for getting students back on track to learn. The Behavior Code reveals a systematic approach for deciphering causes and patterns of difficult behaviors and how to match them with proven strategies for getting students back on track so they can learn effectively. The Behavior Code provides the conceptual background for breaking the code of the four most challenging students in the classroom: students with anxiety-related, oppositional, withdrawn and sexualized behaviors. The book provides, in a user-friendly format, a different kind of behavior intervention plan — we call it the FAIR plan — that outlines effective interventions for students demonstrating these challenging behaviors. 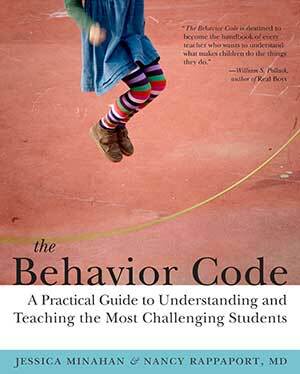 The Behavior Code needs to be read by all teachers, counselors, administrators, and parents! The message is simple: our student’s challenging behaviors will continue if we only use punishments or rewards. Our job as caregivers is to understand our students’ dilemmas and teach then better coping strategies. The authors do not shy away from difficult topics, such as the students who say, “I don’t care”, or who demonstrate sexualized behavior. This book is complete with supportive advice for teachers dealing with the challenging student and worksheets for organizing one’s own teaching around the FAIR Plan thoroughly described in the book. Waste no more time spinning your wheels with challenging students; allow yourself to be guided by the interventions articulated so well in the pages of this book. The Behavior Code is filled with wise and very concrete suggestions for K-6 educators and school counselors. This book insightfully illuminates the nature of anxious, oppositional, withdrawn, and overly sexualized behaviors. And it provides detailed, helpful suggestions that support school personnel anticipating and addressing these kinds of challenging — and often, overwhelming — behaviors. The Behavior Code presents a cogent, succinct, highly readable support system for teachers, behavior specialists, and site administrators. Authors Rappaport and Minahanemploy the process of Antecedent/Behavior/Consequence data collection coupled with case studies to illustrate its practicality and application. The manual is highly useful for staff professional development related to student behavior support plans and behavior intervention plans, both of which support improved student learning.